Kishore Ganji is a highly successful NRI businessman from New Jersey. He happened to read an article of Hari Yelleti and offered him the APF film, which is all set to release on 5 September, 2008. 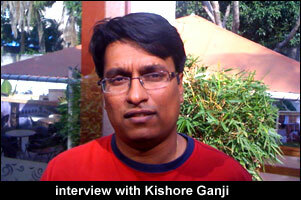 Here are the excerpts of an exclusive interview with Kishore Ganji. I am an engineering graduate from Osmania University, Hyderabad. Later on I worked in HP for a year. Then I migrated to USA and worked for various companies like IBM, Price Waterhouse Cooper, etc. I started my own company 5 years back and it is doing extremely well. What prompted you to make APF? I was always interested in movies. I used to observe technical aspects of filmmaking. I am a regular visitor of idlebrain.com. I saw Hari Yelleti's article 'I am gonna be the next Mani Rathnam...' I found it very interesting. As an NRI successful at business, I know how difficult it is to follow your heart once you start chasing the dollars. Hari Yellti had taken the first most difficult step by leaving his job and coming to Hyderabad to make films. It impressed me. So I thought I am gonna make Hari Yelleti the next Mani Ratnam. I immediately sent a mail to Hari expressing my interest in producing his debut film. Then we became friends through emails. Later he narrated me the script. I liked it and we launched the project last year. Tell us about APF film? Hari Yelleti is a great writer and an excellent narrator. After listening to the script, I thought that we could make a hit film even if he delivers 50% of what he narrated. And he delivered it close to 100%. It took a lot of time and effort, but ultimately Hari succeeded in delivering the right product. APF is a beautiful love story that explores friendship and relationships with the help of cool music. What are you happy about APF? And what are you unhappy about it? I am happy with APF outcome. It has got nice music, good comedy and right emotions. It has got universal appeal and one can watch it together with the entire family. I was unhappy with the delay in execution of the project due to elements that are not in our control. We don't get equal attention regarding infrastructure in film industry compared to big films and big banners. Lots of NRIs came and produced Telugu films and most of them failed. What makes you think that you will break that jinx? Moviemaking is a lengthy procedure. And lots of people start the project with lot of commitment and enthusiasm. But it dies down over a period of time. But the team of APF has the same kind of commitment and energy even on the release day. What are your personal favorites in APF album? Alagake Allari followed by Premani. On the screen, you will end up liking all the songs equally. Are you nervous about APF release? Yes. I feel like a student who has already written the exam and waiting for the results in a couple of days. Even the state topper would be nervous. I am sure that APF will be good. How big the APF will become after release purely depends on how the people will embrace it. What is the USP of APF? APF is a result of team work of highly educated and successful youngsters. I am among the top 40 entrepreneurs in New Jersey. My company is among the top 10 fastest growing Indo-American companies in USA. Director Hari Yelleti is highly successful hardware engineer who worked for Toshiba and NASA. Cinematographer Malini Dasari is an IIM and a graduate from Pune Film Institute. Music director Vinu Thomas is an attorney in Kerala. Hero Nikhil is an engineer. Heroine Megha Burman is a cinema connoisseur and has long-term goal of directing films. Our team of educated professionals worked together to make sure that APF is an intelligent and mature film. And APF is going to standout among the run of the mill films. Do you want to say anything to visitors of idlebrain.com? I visit idlebrain.com everyday. I made this film APF only after reading Hari Yelleti's article in idlebrain. I would not have made this film if not for idlebrain.com. When Hari Yelleti asked IB visitors to suggest a suitable name, we got around 3000 entries. We are not selling film in AP, but we sold it in Bangalore, Chennai and USA. And all these people are not from movie business. They came forward because they trusted that we could deliver a sensible cinema. I am like any other visitor of idlebrain.com. So please watch the film and give your honest feedback about the film.